BAR module is a flexible pedagogical format that aims to generate learning opportunities around different themes and dynamics. It is an intensive working week in the city of Barcelona which aim to create learning opportunities from different topics and dynamics. As part of BAR TOOL#2, the BAR module sessions will be opened to a larger public (researchers, students, curators, artists, educators, etc). With Julie Boukobza (FR), Vittoria Matarrese (IT-FR), Anna Colin (FR-UK), Claudia Pagés (ES). This module will bring a chorus of voices that speaks from the night, the bodies, the feminine, the movements, the independent, the communal or the discordant to compose a shared learning space where the different practices converge. Since 4 years the festival DO DISTURB is putting Palais de Tokyo into a state of effervescence, by day and night, with each year over 40 propositions at the crossroads of dance, performance, theatre and music, pursuing the idea of inviting cultural partners from France and abroad. At the same time, in the fall 2017, Palais de Tokyo inaugurates La Manutention, a residency programme dedicated to performance art. From October to July, six emerging artists are invited to a residency program, for a period of one month each. This new format welcomes and encourages exploration and experimentation, providing artists with the opportunity to develop their practices and produce an original work, turning the spaces of Palais de Tokyo into a studio. Vittoria Matarrese, graduated in architecture in Paris, is now the director of performing arts department Palais de Tokyo and curator for performance art. Her atypical career led her to hold various international positions, including that of artistic director of Villa Medici in Rome and responsible for international communication at the Venice Film Festival. During her career she worked at the intersection of different disciplines, from cinema to dance to theater, collaborating since she was very young with different personalities, such as brilliant choreographers or directors. This polysemy is now at the center of her research on performance art. In her presentation, Anna Colin will share her thoughts on the question ‘What makes an alternative space?’ – the subject of her PhD research – drawing from past curatorial projects, her experience at Open School East as well as from a small range of historical and contemporary international alternative education, art and social spaces and experiments. The alternative space that constitutes the object of her study is a building-based, locally-rooted and democratic cultural, educational and social centre in which different forms of learning, sociabilities, publics and uses cohabit. Her study endeavours to answer the following questions, from architectural, educational, sociological and economic perspectives: What spatial form do alternatives assume? What constitutes realistic alternative governance, financial and business models for such spaces? What does it take to remain alternative as internal and external circumstances change? And how do alternative spaces relate to the broader, society-wide production of political, economic and social alternatives? Anna Colin is a curator, educator and researcher. She co-founded and co-directs Open School East in Margate (UK), an alternative space for artistic and collaborative learning. Anna also works as associate curator at Lafayette Anticipations – Fondation d’entreprise Galeries Lafayette in Paris, and is a PhD candidate in the School of Geography at the University of Nottingham. Anna was co-curator, with Lydia Yee, of the touring exhibition British Art Show 8 (Leeds, Edinburgh, Norwich and Southampton) in 2015-16. Previously, Anna was associate director of Bétonsalon – Centre for art and research, Paris (2011-12), associate curator at La Maison populaire, Montreuil (2012) and curator at Gasworks, London (2007-10). Julie Boukobza is a curator and art critic based in Paris, in charge of the LUMA Arles Residency Program. Boukobza co-curated with Simon Castets a group show at the Museum of Contemporary Art in Belgrade called “FADE IN 2 EXT. MODERNIST HOME» in July 2017. In 2016 she curated the exhibition « Pure Fiction » at Marian Goodman gallery and a solo show of Peter Shire at New Galerie, both in Paris. She currently runs the Luma Arles residency program as well as the 89plus residency program at the Lab of the Google Cultural Institute in Paris. In 2020, she will co-curate with Julia Morandeira Arrizabalaga an exhibition at Centro de Arte Dos de Mayo in Madrid, Spain. For “My studio visit. The city as studio” we will meet at 8:00 at Encants Vells (Mercat Bellcaire) to encounter different traces of how the city’s extraction and the speculation around objects are made in chants. Claudia Pagès lives and works in Barcelona. Pagès’ practice deals with bio-economic processes and translation, and it is published and circulated through performances and readings, printed matter and objects/installations to explore uses and effects of language. The artist has exhibited in solo and duo in institutions such as Yaby, Madrid (2018), La Capella, Barcelona (2017), Rongwrong, Amsterdam (2016), P/////AKT, Amsterdam (2015). Recent performances include Sharjah Art Foundation, Sharjah UAE (2018), Ca2M, Madrid (2017), RAI10/Arthena Foundation, Düsseldorf (2016), La Casa Encendida, Madrid (2016), Moderna Museet, Stockholm (2015). She has been resident at LiveWorks, Centrale Fies (2017), Gasworks, London (2017), Ca2M and La Casa Encendida, Madrid, (2016) and has received the Mondriaan fonds Werkbijdrage Jong Talent, The Netherlands (2016-2017). With Irene Aristizábal (CO-ES-UK), Ad Minoliti (AR), Francesc Ruiz (ES), Antonio Gagliano (AR-ES). This module wants to explore different practices that circulate among queer and decolonial theories, feminisms, pedagogy, drawing, painting, and disturbing dissemination of knowledge to generate projects that, involving different allies in their development, affect different layers of political and social change processes. As an Argentine multidisciplinary painter, Minoliti’s proposal is a combination of painting, video, anime and design. Installations and performance explore alternatives to traditional discourses, involving a diversity of topics such as queer theory, cyborgs, feminism, abstraction, science fiction, architecture or decoration, childhood and animal rights. For Ad Minoliti, geometry is the best tool to experiment with a non-human utopia, where gender theories can be applied to pictorial language and find other ways of investigating the visual world. Ad Minoliti creates pictorial work of a possible combination between geometry and queer theories. In her body of work, geometry is the best tool to represent and imagine a trans-human heterotopia, within which gender theories can be applied to pictorial language and find new ways of experiencing the visual world. Live and work in Buenos Aires. Her exhibitions include: Aichi Triennial (Japan), FRAC Nantes (France), Mercosur Biennial (Brazil), Cleveland Front Triennial, Brooklyn Museum and Independent (NY), Peres Project Galleries (Berlin), Crèvecoeur (Paris) and Agustina Ferreyra (Mexico City); and residencies in Mexico, San Francisco and London, among others. She was awarded with several Acquisition Prizes as Arcos Dorados in Latin America, Biennial Museum of Bahía Blanca, National Central Bank Exhibition, Federico Klemm Foundation, Cultural Equality Prize and Uade. Irene Aristizábal is Head of Curatorial and Public Practice at BALTIC Centre for Contemporary Art, Gateshead. She worked as Head of Exhibitions at Nottingham Contemporary from 2013 until February 2019, where she curated exhibitions and commissioned projects by Pia Camil, Steffani Jemison, Otobong Nkanga, Simon Starling, Michael Beutler, Pauline Boudry/Renate Lorenz, Sun Ra, Rana Hamadeh, Danai Anesiadou, Danh Võ, Carol Rama and Asco. Recent group exhibitions include Still I Rise: Feminisms, Gender Resistance (2018-19 – co-curated with Rosie Cooper and Cédric Fauq) and States of America: Photography from the Civil Rights Movement to the Reagan Era (2017 – co-curated with Abi Spinks). Irene will be co-curating the British Art Show 9, alongside Hammad Nasar, which opens in Manchester in 2020 and travels to Wolverhampton, Aberdeen and Plymouth. She was curator at the FRAC Nord Pas de Calais, Dunkirk in 2010–11, and was the recipient of the H+F Curatorial Grant (2010). Prior to that she co-directed the not-for-profit space Bétonsalon in Paris (2005-06). She has also curated exhibitions at the Fundació Miró, Barcelona; Form Content, London and the Museum of Health Sciences, Bogotá. 5 – 9 november 2018: PERRRFORRRMANCEEEEEEEE. The program will consist in workshops by Nico Vascellari (IT), Cecilia Bengolea (AR-FR), Joan Morey (SP) and the unmissable My studio visit. The city as studio with Duen Sacchi (AR-SP). This module wants to challenge the idea of performance, following the current evolution of it practice and it inherent performative character. Attending to the openness and fluidity of performance, its social and political implications and its level of public understandability, the invited guests will as articulate lectures and workshops that will allow us to think performance as work space, as an instrument and cultural exercise, opened to a wide range of performative actions. BAR module February 5th-9th: The program will consist in seminars by Emily Pethick (The Showroom director, London) and Susan Gibb (curator of If I Can’t Dance, I Don’t Want To Be Part Of Your Revolution, Amsterdam) on the processual and performative development of the institutions the direct; as well as a workshop on ethics and legality held by Nuria Güell (artist, Barcelona); and the unmissable My studio visit. The city as studio with Aimar Pérez Galí (dancer, artist and researcher, Barcelona). BAR module April 9th-13th: The program will consist in seminars by Philippe Pirotte (director of Fine Arts School Städelschule and of the exhibition space Portikus, Frankfurt) and Vivian Sky Rehberg (director of the Fine Arts Master at Piet Zwart Institute, Rotterdam), respectively on art and activism at the Jakarta Biennale and speculative writing; as well as a workshop on the phenomenological experience in arts held by Daniel Steegmann Mangrané (artist, Río de Janeiro); and the unmissable My studio visit. The city as studio with Jordi Ferreiro (artist and educator, Barcelona). BAR project offers a grant covering registration for a national or international participant for each of the BAR module, and a grant offered by Fabra i Coats Art Factory covering the registration for a participant based in Barcelona for each of the BAR module. The 4 grants will be awarded based on need and merit; the candidate must specify it on the application. Aimar Pérez Galí develops his artistic practice in the dance and performing arts field as a dancer, choreographer, researcher, pedagogue and writer, always departing from the body as a reference place, understanding dance as a tool for critical transformation. Philippe Pirotte is director of Frankfurt’s Städelschule art school and its gallery Portikus. Recently, he was curator of the 2017 Jakarta Biennale and the 2016 Montréal Biennale. Vivian Sky Rehberg is Course Director of the Master of Fine Arts at the Piet Zwart Institute in Rotterdam, the Netherlands, and a contributing editor of frieze magazine. Daniel Steegmann Mangrané is an artist from Barcelona based in Rio de Janeiro. His practice covers various media and oscillates between subtle, poetic, and crude experimentations that question the relationship between the world and language. Jordi Ferreiro is an artist and educator. His work explores the processes of reception and interpretation of artworks – in both the educational and artistic contexts – via the use of performance and public participation. With: Eva Rowson (Showroom, London), Pablo Martínez (MACBA, Barcelona), Santiago Villanueva (Mamba, Buenos Aires), Leire Vergara (Bulegoa, Bilbao), Helmut Batista (Capacete, Rio de Janeiro), Elise Lammer (SALTS, Basel), Daniel Blanga-Gubbay (Aleppo, Brussels), Karima Boudou (Appartement22, Rabat), Equipo Palomar (artists, Barcelona), Josep Maynou (artist, Berlin), Florencia Portacarrero (curator, Lima), Kroot Juurak & Alex Bailey (performers, Wien), BAR TOOLests (Julia Gorostidi, Tali Serruya, Enea Cabanes, Alejandra Avilés, Ibai Hernandorena) & BAR spring residents: Valerio Del Baglivo (curator, Rome), Daisuke Kosugi & Ina Hagen (artists & founders of Louise Dany artist run space, Oslo). Drinking while walking while hosting while thinking while making together is the leitmotiv of BAR project, who takes its name from the popular and social gathering place in south European culture in order to recontextualize it, and be able to work and practice (reflection-in-action) in a flexible, informal and critical way. This working condition and status goes beyond the bar extending curatorial practice into working on public realm and takes the city of Barcelona as a public project space. At the center of BAR project’s curatorial effort the Public Program operates as a transversal yet autonomous space responding to concerns about its own practice: delve into the public realm today; give room to gathering, discussion and reflection spaces; promote a dialogue with the immediate context and beyond it. BAR project stands for a public program to take place in spaces of diverse nature, aiming to provoke unexpected relationships and challenge audiences. In this regard, the different activities BAR project has organised to date have happened in galleries, non-profits, institutions, along with bars, car garages, libraries or the public space. The BAR International Symposium “Making Public Program” consists in an intensive week of working groups, roundtables, actions, My studio visit, Walking tour, performances and drinks to celebrate BAR project 2013-2017 Public Program and reflect on the past, present and future of what public programing means. A number of guest practitioners will spend a whole week in Barcelona in order to discuss and perform together on the topic; the output of that brainwork will be made public and opened to the participants of the symposium and to a larger public through the various activities building the symposium. Monday to Wednesday mornings will be devoted to closed working sessions on “Making Public Program” among guest speakers and BAR team at Fabra i Coats Art Factory. In parallel to this, the registered participants will take part in The Walking Tour, comprising visits to galleries, independent spaces and institutions in and around the city of Barcelona. In the afternoon round tables lead by one of the guests will offer the participants a disclosed space for reflection and discussion. Monday evening will be liven up by the legendary BAR Welcome vermouth, offered at mitico Armando´s. Thursday morning will start with My Studio Visit. The city as studio, in which a local artist is commissioned to give a visit to a special location in Barcelona in order to speak about his/her practice through the city and out of the common studio space. On this occasion artistic collective Equipo Palomar invites us to Estruch 24-26, 3° 1ª, an action focusing on the figure of Alberto Cardin, an outstanding writer, anthropologist and LGBT activist, emphasizing his early death in 1992 due to AIDS, the relationship between the Spanish political transition and the disease, as well as the city’s tourist-urbanistic speculation. The day will continue at Tàpies Foundation. In the early afternoon Kroot Juurak & Alex Bailey will develop their Workshop for Humans (informative workshop to learn the tricks and tips of Performance for pets previously carried out in private home), later on most of the guest speakers will contribute to a fourth and final round table, open to the general public this time. The culmination of the day will come with the BAR Party, celebration of BAR project fifth birthday, held at the Tapies Foundation rooftop with a live show by Josep Maynou as guest artist. Along the four days, the participants of BAR TOOL#0 training program will ‘rehearse’ on public appearance in different places and afterwork moments. Friday will be the time to carry out studio visits with local artists. Guided tour at “Ground Control” exhibition, Joan Prats Gallery, by the artist Teresa Solar. A narrative about three capital cultural agents in Buenos Aires, from 1960 to 1995: Jorge Romero Brest (from the Di Tella Institute), Oscar Masotta (intervening critically in the artistic scene), and Jorge Gumier Maier (from the Rojas Center). Founding Director of the Art Department at Torcuato Di Tella University, she received a Master’s degree from the Center for Curatorial Studies, Bard College, New York (2001). Among other books, he edited Listen, Here, Now! Argentine Art of the Sixties: Writings of the Avant-Garde, The Museum of Modern Art, New York, 2004. He is part of the Advisory Board of the magazine Otra Parte de Artes y Letras, and of the Advisory Council of Museo Malba. Through examples taken from my own curatorial practice and a few others, and relying on theoretical concepts such as the notion of womb-envy by Gayatri Spivak, Walter Mignolo’s frontier thinking, or the post-human of Rosi Braidotti, I will try to prove that feminism is not reduced to an outmoded political dogmatism, it is a broad philosophy that goes further than the question of gender: a prism by which we can observe the world and understand clearly the relations of power and oppression that surrounds it. Dorothée Dupuis (1980, Paris) is an independent curator, writer and editor based in Mexico City. She was director of Triangle France (Marseille, 2007-2012). Is founder and editor of Terremoto and co-director of Petunia magazine.Her recent curatorial projects include a residency at PAOS Gdl, Guadalajara, Adrien Vescovi at IFAL Casa de Francia, Mexico DF, and the 30 International Art Workshops at the FRAC Pays de la Loire, Nantes, France. She has written in numerous catalogs and art publications and is a regular contributor to Spike Art Daily, Metropolis M, Mousse, Kaleidoscope, ArtReview, Flash Art and Frieze, among others. One of the pillars of the Academy is based on the transmission of knowledge, and one of the ways to do so is sharing quotes, which requires a repetition of the same, but it is also the job of the female researcher to introduce new ones. I choose to take this quotes, footnotes and bibliography to one’s reality, to verify what we can use and how we’ve been influenced by reiterating this quotes for generations, contextualizing them and when possible, re-updating them, with the intention of decolonize the quotes, footnotes and bibliographies to build and embodied theory. Gelen Jeleton (Murcia, 1975) develops her artistic practice with Jesús Arpal Moya in Equipo Jeleton since 1999. My studio visit.The city as studio is a format in which a local practitioner is commissioned to give a visit in a particular location/place/venue of Barcelona linked to his/her work, in order to speak about his/her own practice through the city and out of the common working studio space. A lecture weaving together the LA-based fringe religion Scientology, the Anti-Psychiatry movement and revelations from the Schizo-Culture conference, the legendary 1975 conference on the challenges of psychiatric institutions that brought the then-unknown radical philosophies of post-’68 France to the American avant-garde. Summer Guthery is a curator and writer based in Los Angeles. She is the founder and director of non-for-profit exhibition space, JOAN. She received her MA in Curatorial Studies from Bard College’s CCS. Guthery is a regular contributor to Frieze and Artforum amongst other publications. The epidemic of mental illness that we (supposedly) live, treated only with drugs and supported by biologistic visions of our psyche, compels us to review the teachings of antipsychiatry, in a twist that returns insanity to the center of public debate, to the community, where cultural production is capable of revealing the political issues that are hidden in the psychopathological. Alfredo Aracil is a curator at Sala de Arte Joven de Madrid 2017 with the project “Apuntes para una psiquiatría destructiva (Notes for a destructive psychiatry)” which questions production mechanisms of mental disorders, as well as institutions and clinical methods involved in health management. He has collaborated with magazine Nosotros, El cuaderno, Tendencias, LUMIÈRE and now is writing for Atlántica XII and El Estado Mental. Moving through lands, cities and buildings, through intimate, forbidden and public spaces, through bodies and between lands and ever slipping from control or containment, bodies of water are linked to an imaginary of crossing, to movements of passage. Following the waters, a different cultural cartography appears – one that flows through the geography constructed by demarcations of national territories, of property and of linear histories. The Many Headed Hydra explores the waters as rhizomatic narrative space and as potential infrastructure of commons. Emma Haugh is a visual artist and educator based in Dublin and Berlin. Suza Husse runs since 2012 the interdisciplinary art space District Berlin with an emphasis on artistic research, collaborative practices, public space, critical education and political imagination. BAR project takes a step further launching BAR module, a new flexible pedagogical format that aims to create learning opportunities from different topics and dynamics. The first BAR module: Curating the space / Space for curating highlights the research for a territory of curatorial expression. The program will focus on providing a context for an intensive professional exchange about this very important issue on curatorial work nowadays. 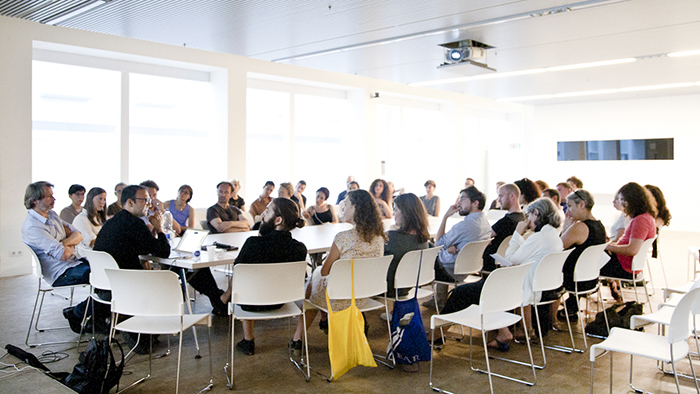 Seeking to create an intimate and informal learning environment, a group of participants will gather international guest curators to think, question and develop ideas on curatorial practice over a period of a week. Following the modus operandi of BAR project, hospitality will be at the core of the program, generating an environment where knowledge transfer occurs from experience, conversation and action. The program will start with The Walking Tour by BAR project in the city of Barcelona, a selection of guided visits to commercial, institutional and independent spaces, as well as tailor-made meetings with local practitioners. The following days of the program will take place at Fabra i Coats – Barcelona Art Factory. Consisting in daily public lectures and conversations led by Sofía Hernández Chong Cuy (Curator of Patricia Phelps de Cisneros Collection, New York), Chus Martínez (Head of the Institute of Art at the FHNW, Basel) and Michy Marxuach (Co-founder of Beta-Local, San Juan, Puerto Rico), all participants will have the opportunity to present their personal statements and points of view on the subject. Last day at Fabra i Coats will include a public talk among the three guest curators together with other local practitioners, followed by a party. The weekend will be devoted to studio visits with local artists around the city. motivation letter (up to 500 words) explaining your relation with the subject. Three accommodation grants are offered based on need and merit. Please specify this request on the application. Sofía Hernández Chong Cuy is a curator, writer, and traveler. Since 2011, she works as the curator of contemporary art for Colección Patricia Phelps de Cisneros. Most recently, she was also the artistic director and chief curator of the 9a Bienal do Mercosul | Porto Alegre in Brazil. She has been engaged with several arts organizations in numerous ways, such as being founding board member of Kunstverein in Amsterdam, forming part of the board of directors of Triple Canopy in New York or being the director of Museo Tamayo in Mexico. Chus Martínez is the Head of the Institute of Art of the FHNW Academy of Arts and Design in Basel, Switzerland. Before she was the Chief Curator at El Museo Del Barrio, New York. She was dOCUMENTA (13) Head of Department, and Member of Core Agent Group. Previously she was Chief Curator at MACBA, Barcelona (2008 to 2011), Director of the Frankfurter Kunstverein (2005–08) and Artistic Director of Sala Rekalde, Bilbao (2002–05). Michelle Marxuach lives and works in San Juan, Puerto Rico. She is the co-founder of Beta-Local. Her practice is born out of an interest to enhance the creative field and encourage interdisciplinary practices that rethink and redesign their own forms and structures to articulate answers and invent solutions to current issues. She believes that creative, aesthetic thinking is essential for healthy social change.